Coffee is thought to have originated in the mountains of Ethiopia. Today the plants grow in many tropical and subtropical areas and reach a height of up to 9 m. In Europe it is too cold to grow coffee outdoors all year round, so it should only be kept outside during the summer or the warmest months of the year. It can also be grown in greenhouses. The plants like bright, sunny spots in your home, ideally where they are protected from the intense midday sun. Placing the plants in southern and eastern windows is ideal. If you want to bring your coffee plant outside, make sure it is at least 20 degrees Celsius outside. Semi-shady locations are perfect for coffee plants. They love high humidity, so they should regularly be sprayed with calcium-free water. You can also place a bowl filled with water nearby the plant. Although the coffee plant doesn't usually grow higher than 1.5 m, it becomes bushier over time. After about five years, the coffee plant begins to bear wonderfully fragrant, white flowers. 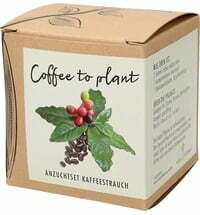 Later, the plant grows berries that each contain two coffee beans. If the berries are intensely red after several months, you can harvest them and cut out the coffee beans. Dry them in a warm place, occasionally turning them. Roast for 10 to 20 minutes on high heat in a frying pan. Then leave the beans to rest for two or three days and grind them in a coffee grinder - now you can enjoy your own homemade coffee! Tips for strong and healthy plants! Use an airy substrate - for example, rhododendron earth mixed with lava granules. When growing, keep at a temperature of 22 ° C to 25 ° C; making sure the temperature does not fall below 15 ° C.
Replant the coffee plant regularly - every two to three years in the spring. Its roots require plenty of space. Never water your coffee plant with tap water as it does not tolerate calcium. Use rainwater instead. Make sure the roots stay moist throughout the summer. 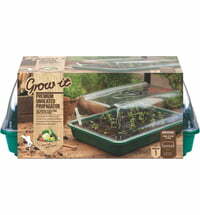 Keep the plant watered over winter as well. 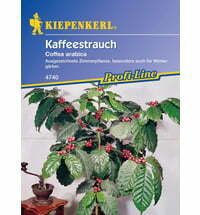 In summer, fertilize the coffee plant every two weeks with an organic fertilizer. Fertilizing is not necessary in the winter. The coffee plant is not only a popular decorative plant, it also serves as a valuable food source for beneficial animals. Bees love coffee plants and are attracted to the caffeine in the coffee flower's nectar. It's not just coffee beans that contain caffeine, their flowers also contain caffeinated nectar. This nectar is very attractive for bees. Caffeine makes busy bees as alert as it does humans. Studies have shown that bees prefer to return to flowers containing caffeine-containing nectar. The caffeine it contains helps the bees remember these flowers. But that's not all: bees don't just return to caffeinated flowers, they prefer to fly to them and avoid other plants. Just like we enjoy our morning cup of coffee, bees head straight for plants with caffeinated nectar. When bees discover a coffee plant, they are so happy that they fly back to their beehive and dance in front of it to show other bees where to find the coffee plants. They're just sharing what they love! If you want to treat your local bees to a special treat, you can plant a coffee tree in your garden or on your balcony. Coffee trees love a warm and shady location and grow their first flowers and berries after around five years. Give something back to the environment while enjoying your beautiful plant and tasty beans!